Although always physically a part of the Presidio, Fort Winfield Scott functioned as a separate military command. 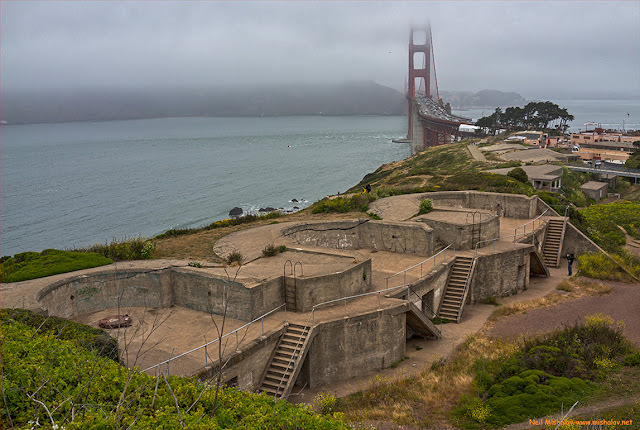 On 9 June 1925, it was designated headquarters for the "Coast Defenses of San Francisco.” Fort Winfield Scott supported and manned Endicott Period gun batteries in the San Francisco Bay Area. Some of the gun batteries were located at Forts Baker, Barry, and Cronkhite in Marin County and Forts Miley and Funston in San Francisco. 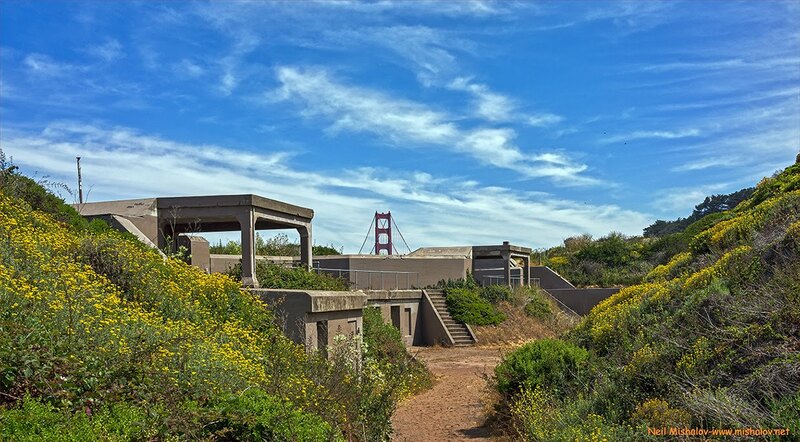 Fort Winfield Scott was also responsible for seventeen Endicott-era gun batteries within the Presidio. 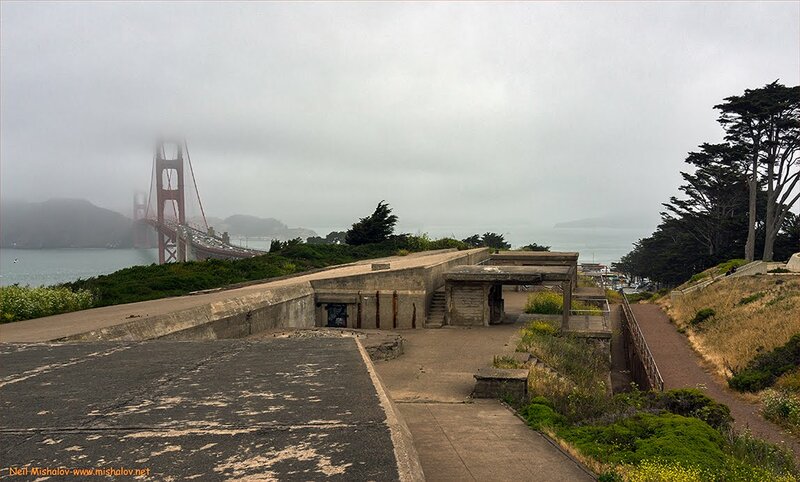 These gun batteries were constructed, armed, and manned between 1891 and 1946. 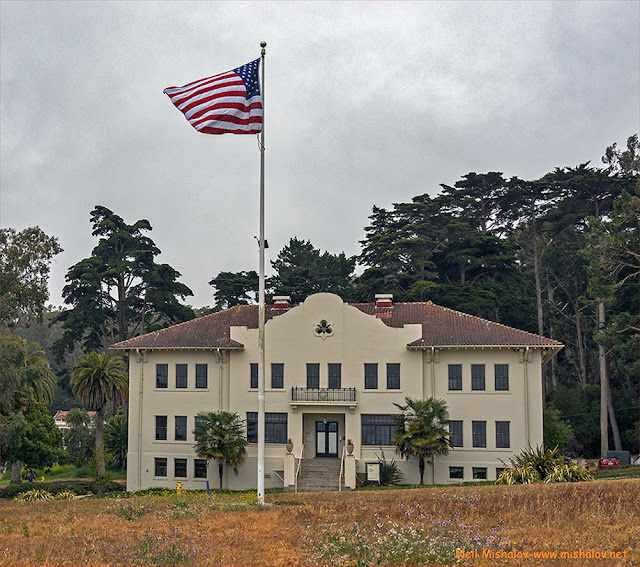 Fort Winfield Scott's independent role, established in 1912, permanently ended on 25 June 1946, when the fort was designated as a sub-post of the Presidio of San Francisco. This is Fort Winfield Scott's headquarters building. Construction of this army post began in 1909. In addition to the administration facilities, there were ten enlisted men's barracks, officer housing, and an Army prison. This photo was taken from the parade ground, and the view is looking west. Here are two of the ten enlisted men's barracks that were built between 1909 and 1912. This is a view from the parade ground looking north. The site of Battery Dynamite is located in the treed area behind the barracks. 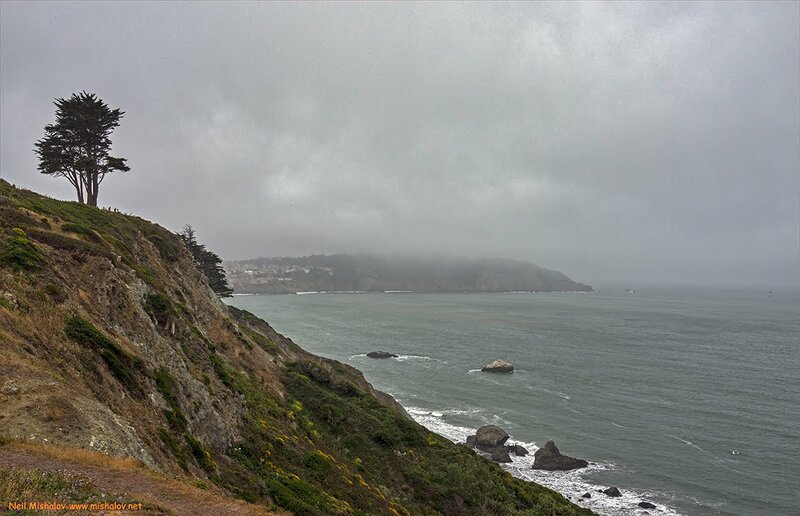 It is a foggy summer morning in San Francisco; this is a view looking north from the gun battery bluffs of the Presidio. 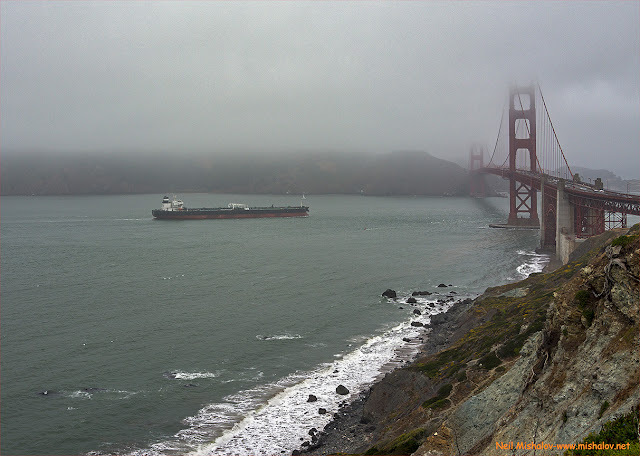 The ship heading under the Golden Gate Bridge appears to be an oil tanker traveling to the Chevron Richmond Oil Refinery. 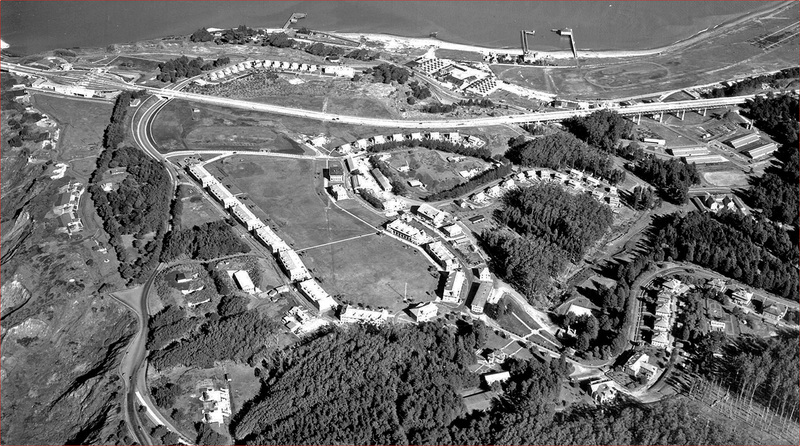 This aerial photograph of Fort Winfield Scott was taken in 1939. The Golden Gate Bridge is just out of sight at the top left corner of the picture. Many of the gun batteries sited on the bluffs overlooking San Francisco Bay can be seen on the left side of this photo. From top to bottom they are Battery Cranston, Battery Marcus Miller, Battery Boutelle, and Battery Godfrey. Battery Dynamite and Battery Saffold are also visible, amongst other gun and mortar batteries. The parade ground, the enlisted men's barracks, the headquarters building, the Army prison, and officer housing are also visible. This view is looking north. THEN This 10-inch disappearing gun at Battery Marcus Miller is sited at gun battery position one. This disappearing gun is in its raised, ready to fire position. There were three 10-inch disappearing guns mounted at Battery Marcus Miller. The construction of Battery Marcus Miller commenced on 2 June 1891. The three guns were placed on the site in 1897. The battery was eventually considered obsolete, and the guns were ordered removed in July 1918. This photo is circa 1910. NOW This is Battery Marcus Miller's gun battery number one. The orange buildings ahead are maintenance workshops and offices for the Golden Gate Bridge, Highway and Transportation District. 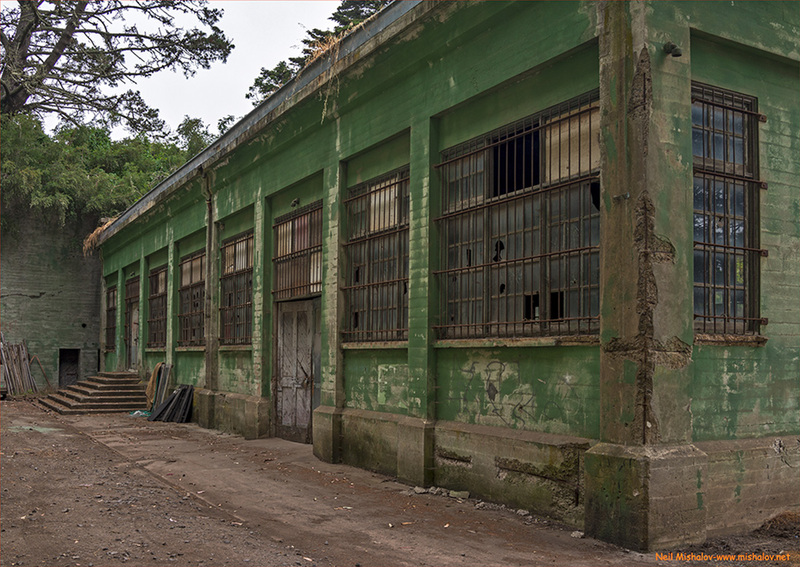 The offices and workshops occupy the site of Battery Cranston. This is Battery Marcus Miller's gun battery number two. Here is Battery Marcus Miller's gun battery number three. NOW This is a photo of Battery Cranston's gun battery number two. 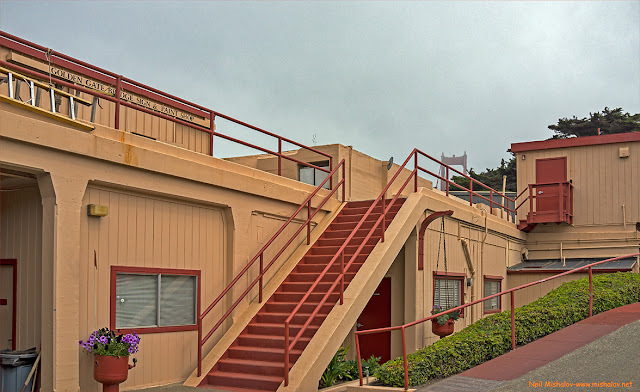 It is now used as office space for the Golden Gate Bridge, Highway and Transportation District. The construction of Battery Cranston commenced on 10 June 1897. Battery Cranston had two ten-inch disappearing guns; they were installed on 31 March 1898. 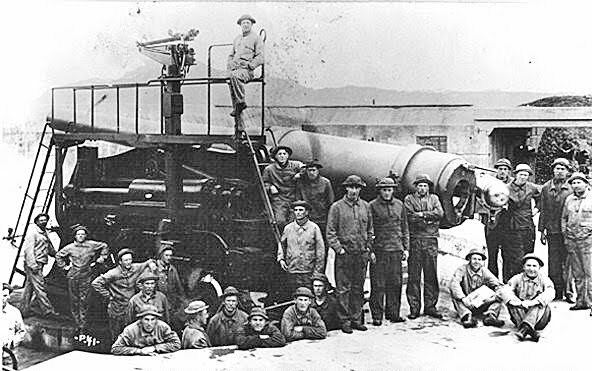 During World War II, Battery Cranston was declared obsolete, and on 21 November 1942 the guns were ordered removed and scrapped. 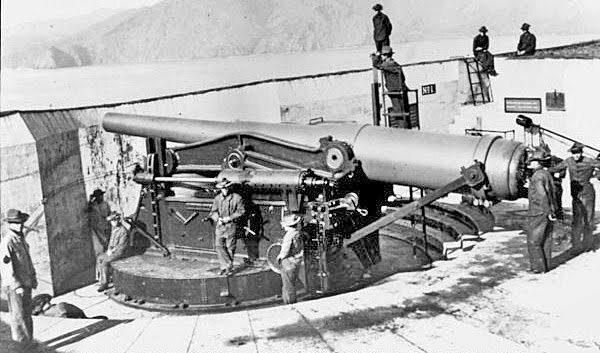 THEN Battery Cranston was armed with two 10-inch disappearing guns. This is gun battery number two. The gun as seen in this picture is in its lowered non-visible position. This photo is circa 1910. 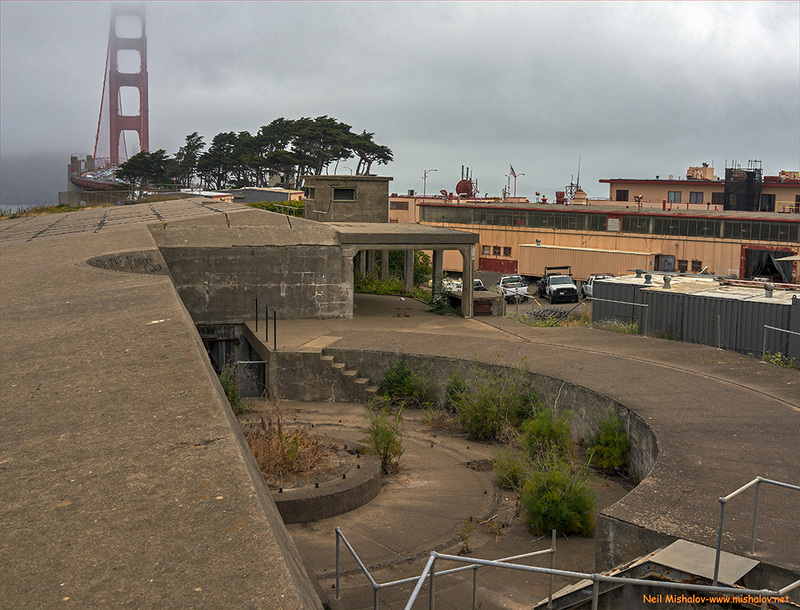 NOW A partial view of Battery Cranston's number two gun's firing position; it is now occupied by the Golden Gate Bridge, Highway and Transportation District; it is being used as office space. 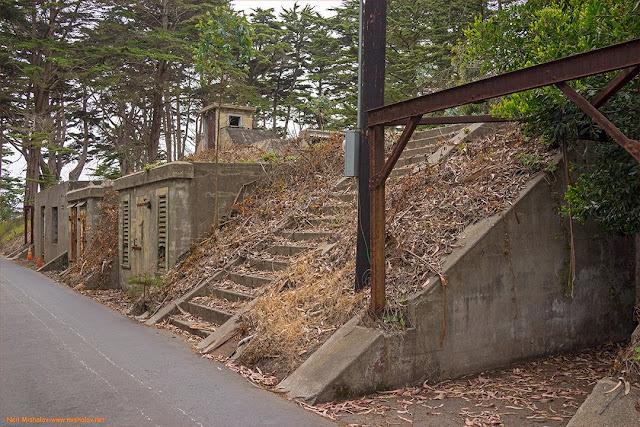 THEN This is Battery Boutelle. The picture is circa 1910, and the view is looking north. NOW Battery Boutelle had three 5-inch guns. Construction of the battery commenced in 1898, and the three guns were placed in 1901. Within sixteen years Battery Boutelle was considered obsolete, and on 31 December 1917, its three 5-inch guns were ordered removed. 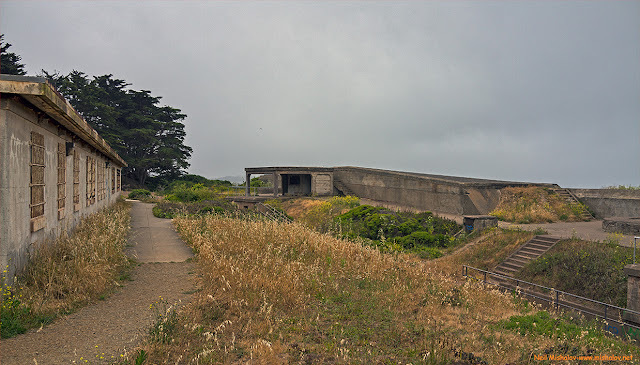 Here is a view of gun battery number three at Battery Boutelle. This photograph of Battery Godfrey was taken in 1938. 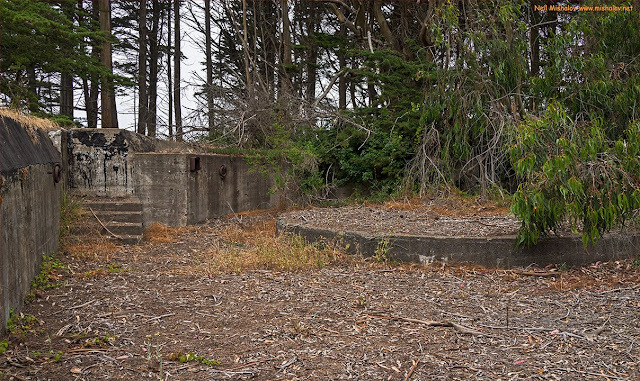 This gun battery had three non-disappearing 12-inch guns. 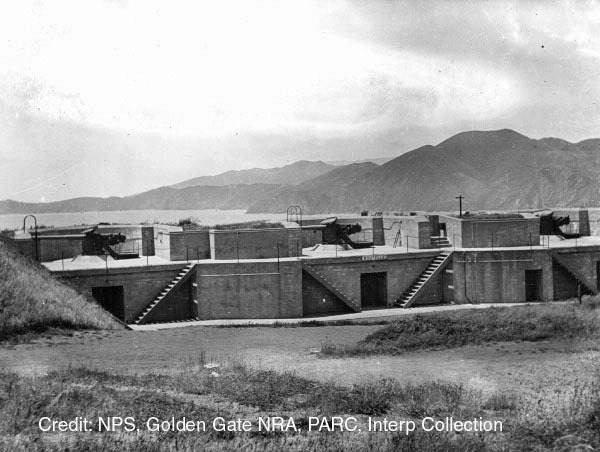 The construction of the gun battery commenced in 1892. Two of the three guns were placed in 1896, and one was placed in 1897. During World War II, the guns were deemed to be obsolete, and they were ordered to be removed on 19 November 1942. This is one of the three non-disappearing 12-inch guns at Battery Godfrey. This picture is circa 1910. 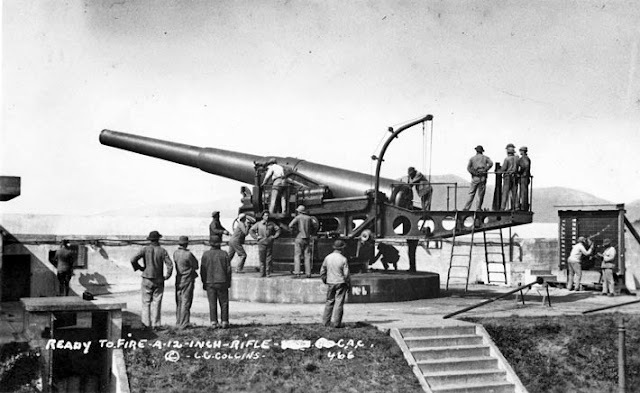 Battery Godfrey's gun battery number one is being prepared to test fire a 12-inch round which weighed approximately 1,070 pounds. This photo is circa 1910. 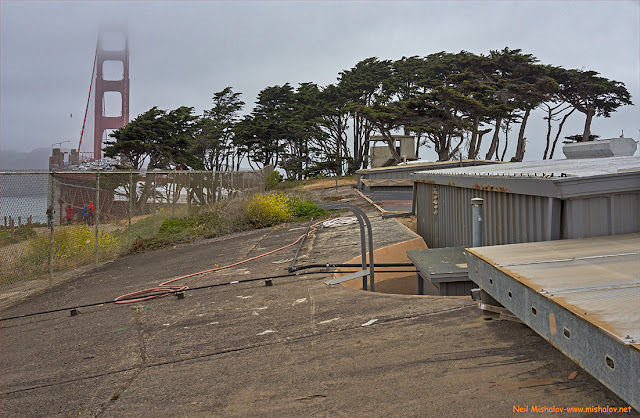 Battery Godfrey gun battery number two is being test fired. Circa 1910. Here is a view of Battery Godfrey looking west. This is a view of Battery Godfrey looking north. Battery Godfrey's gun battery number three is being test fired with civilians observing the event. I believe this firing took place on the 4th of July, in celebration of Independence Day. This photograph is circa 1910. 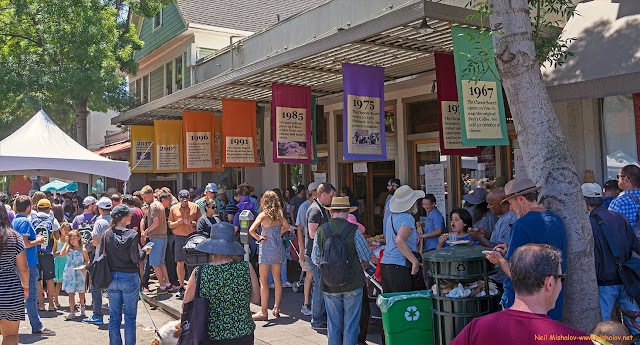 The one-story cinder block building partially visible on the left side of this photograph is Presidio building #1648. 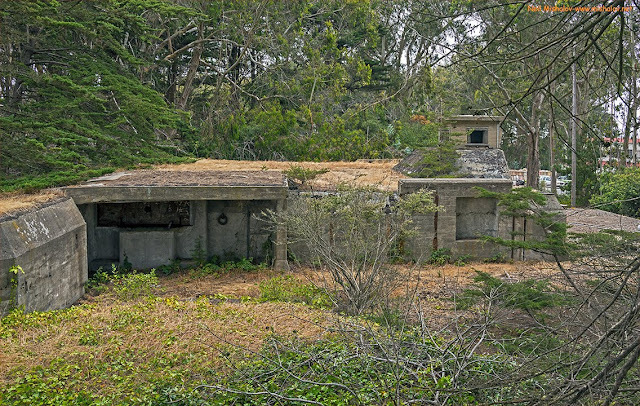 It was the site of the San Francisco Bay Area Nike Missile Headquarters. During the Cold War, in the 1950s thru the 1970s, there were up to twelve Nike missile launching sites located in the San Francisco Bay Area, and approximately 280 Nike missile sites nationwide. On the right side of this photo is Battery Godfrey. The view is looking west. A view looking west from the Presidio's coastal bluffs. Ahead in the distance is San Francisco's Land's End. Fort Miley was sited at Land's End. Its mission was to defend the Bay Area from enemy ships attempting to enter San Francisco Bay. This is a combined Harbor Defense Command Post - Harbor Entrance Control Point. It was a bomb-proof reinforced concrete two-story command/observation post. Construction of the post was authorized after the bombing of Pearl Harbor on 7 December 1941. The post was built in 1943, and it became operational on 8 January 1944. The main part of the post was roofed with reinforced concrete, and with earth cover for overhead protection. This structure provided 44,900 cubic feet of gas-proof space. The first floor consisted of 16 room of various sizes. The second floor housed one observation post for the Navy and one observation post for the Army, as seen above. This underground command post is not accessible to the general public. Battery Godfrey's commander's observation post and plotting room. This observation post became operational on 31 December 1900. During the American Civil War advances in artillery proved that brick and masonry forts were unable to withstand bombardment by heavy artillery. 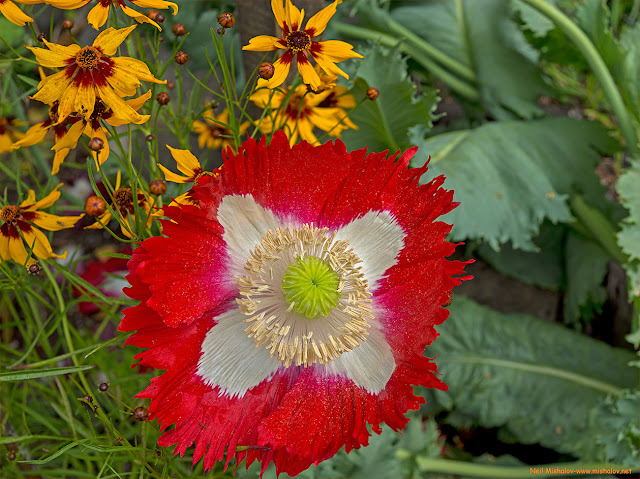 Thus, the period following the Civil War was marked by revisions to the United States seacoast defense system; earthwork gun batteries replaced brick and mortar forts. In 1872, work began on several new gun positions on the coastal bluffs overlooking San Francisco Bay. 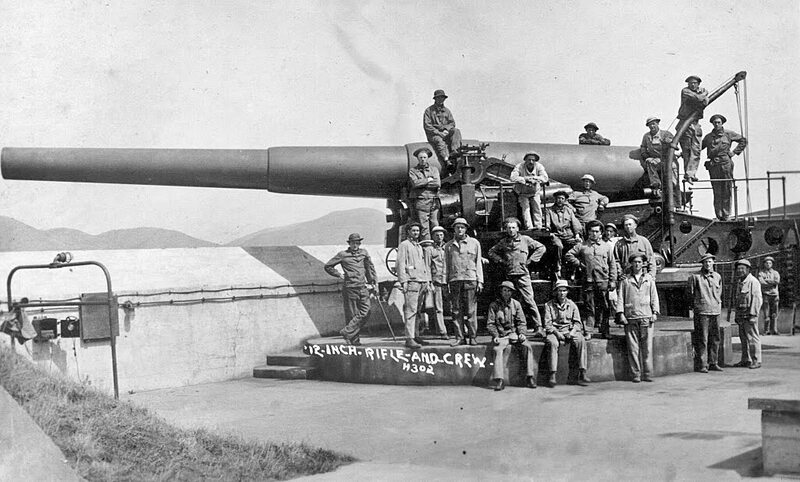 In 1873 West Battery was completed and armed with twelve 15-inch Rodman guns. 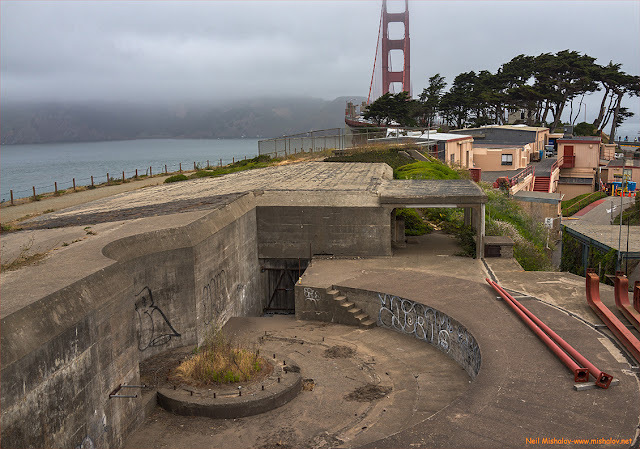 When the Endicott-period gun batteries were constructed at the Presidio during the 1890's, Fort Point's West Battery was almost completely demolished. 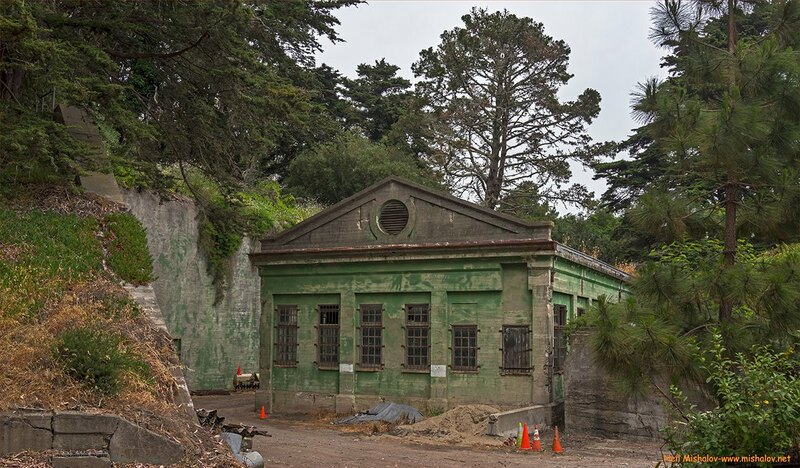 This was done in order to build new Endicott gun batteries on the coastal bluffs overlooking San Francisco Bay. This is the remains of an earthen powder magazine at West Battery. This photograph of Battery Saffold was taken in 1938. Battery Saffold was sited just west of Battery Dynamite; It had two non-disappearing 12-inch guns. 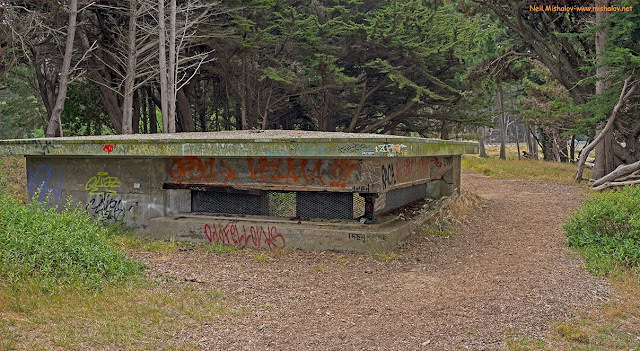 The construction of this gun battery began in 1897. One of the two guns was placed in 1897, and the second gun was placed in 1898. Battery Saffold became operational on 4 February 1898. 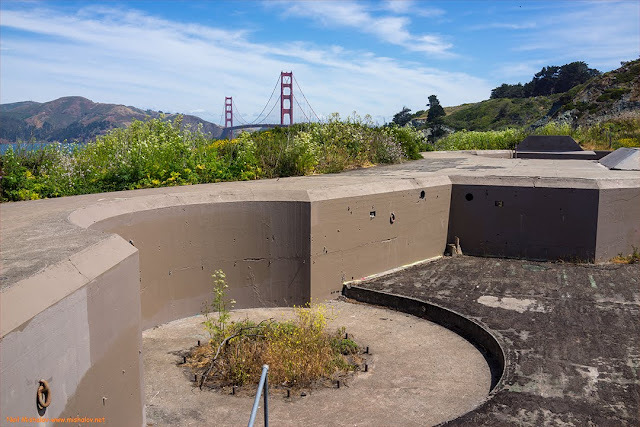 While the battery could fire seaward, Battery Saffold was unique because recesses existed in the parapet walls of the battery which allowed the two guns to also fire directly into San Francisco Bay. 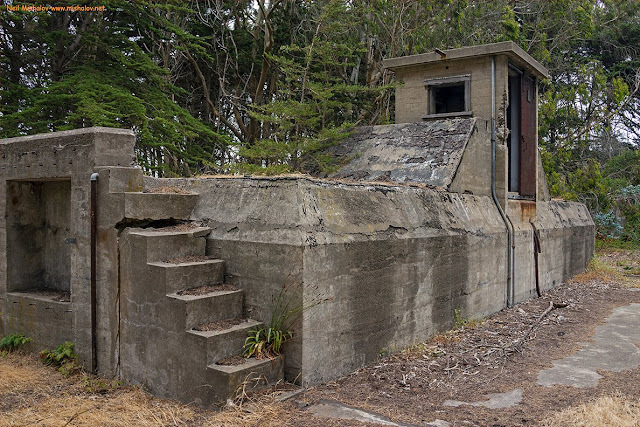 The battery remained in service through the beginning of World War II, after which the guns were deemed to be obsolete, and they were ordered to be removed on 19 November 1942. Battery Saffold is closed to the general public. Battery Saffold's battery commander's post is visible in this picture. 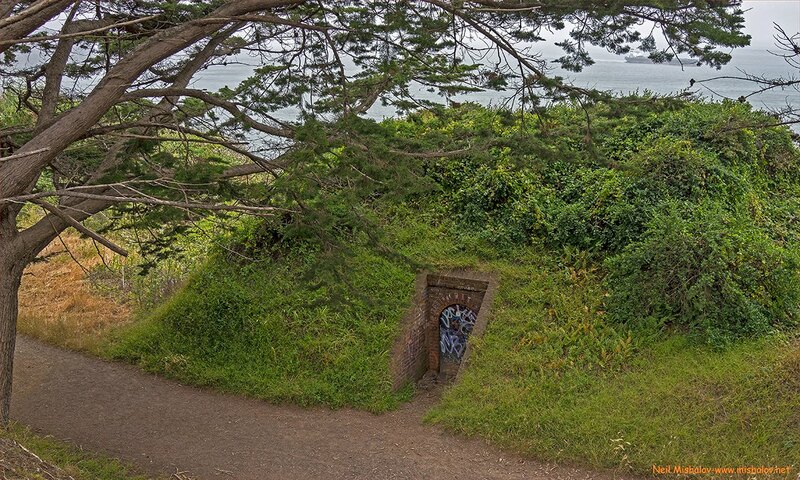 It was added to the battery in 1900. This was the location of gun battery number one. 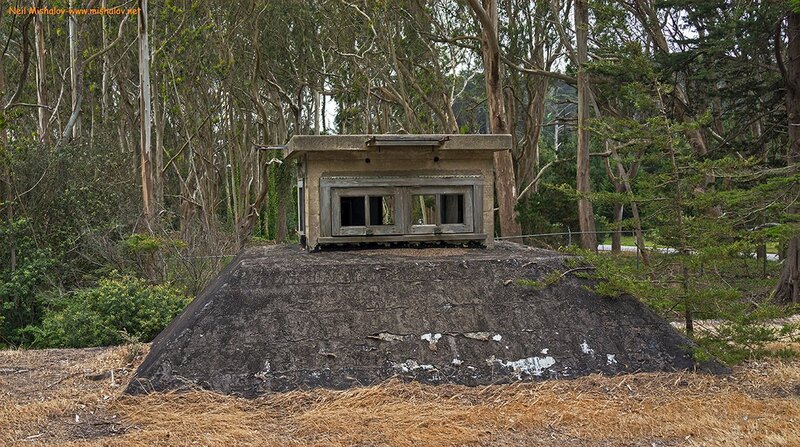 The battery commander's observation post. NOW This was the location of gun battery number two. THEN This is a view of gun battery number two with three medical personnel from the Presidio's Army Hospital on site. This photo is circa 1920. Here is the location of gun battery number one. This is the rear of Battery Saffold. This was the Battery Dynamite powerhouse. It supplied compressed air at 2,500 pounds per square inch with which to fire the pneumatically launched dynamite shells. The construction of Battery Dynamite began in 1894. Three dynamite guns were placed at Battery Dynamite in 1895, and Battery Dynamite became operational on 8 June 1900. All pneumatically launched dynamite gun batteries in the United States were declared obsolete in 1901. The three guns of Battery Dynamite were ordered salvaged in 1904. Once disarmed, the site of Battery Dynamite was used for many different purposes over a period of multiple decades. Here is another view of the Battery Dynamite powerhouse. During November 2016, I visited Battery Dynamite. 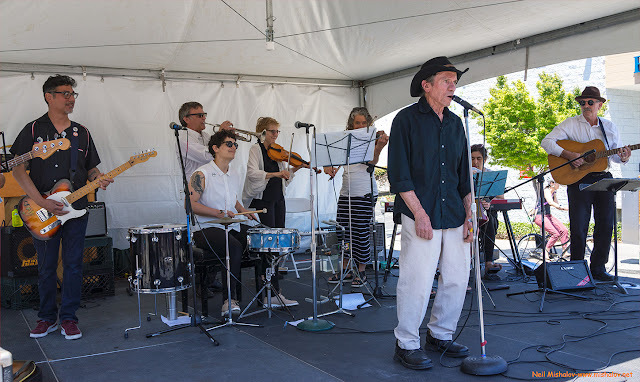 Go Here to see the photographs that I took of Battery Dynamite. 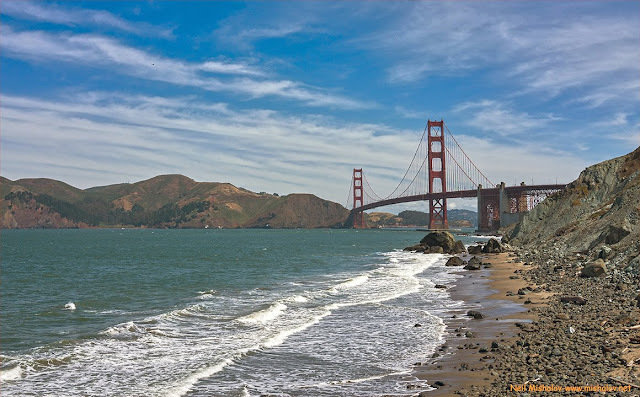 Fort Point is a brick and masonry constructed fortification located at the entrance to San Francisco Bay at the southern terminus of the Golden Gate Bridge. The Army Corps of Engineers began the construction of Fort Point in 1853, and a crew of 200 men labored for eight years in the building the fort. In 1861, with civil war looming, the army had soldiers stationed at Fort Point to defend San Francisco against attacks by Confederate warships. Throughout the American Civil War(1861-1865) artillerymen at Fort Point stood guard against a Confederate attack that never came. In August of 1865, the Confederate raider ship CSS Shenandoah was in the Pacific Ocean sailing north towards San Francisco. As the vessel approached San Francisco Bay, the captain of the CSS Shenandoah received an urgent message stating that Confederate forces had surrendered to Union troops three months previously, on 13 May 1865. On the Atlantic Coast, severe artillery damage was rendered to similarly constructed brick and masonry forts during the Civil War. That fact brought into question the effectiveness of brick and masonry forts against the new high powered artillery shells being used by Confederate naval ships. 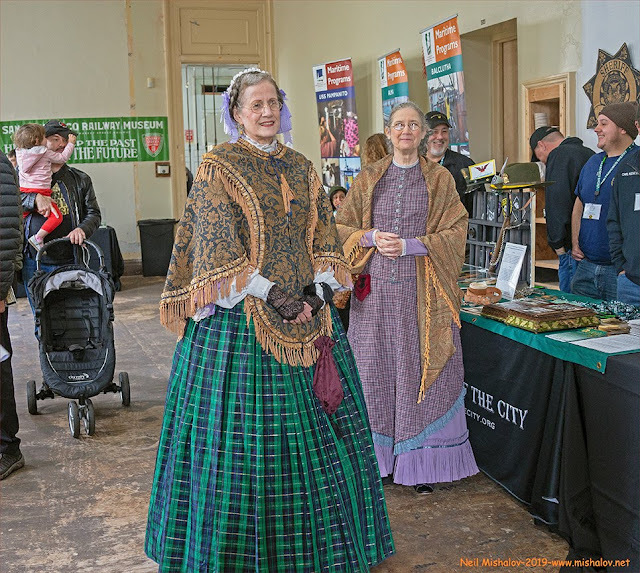 Shortly after the conclusion of the Civil War, Army troops vacated Fort Point, and it was never again continuously occupied. THEN This photo of Battery Crosby was taken in 1938. 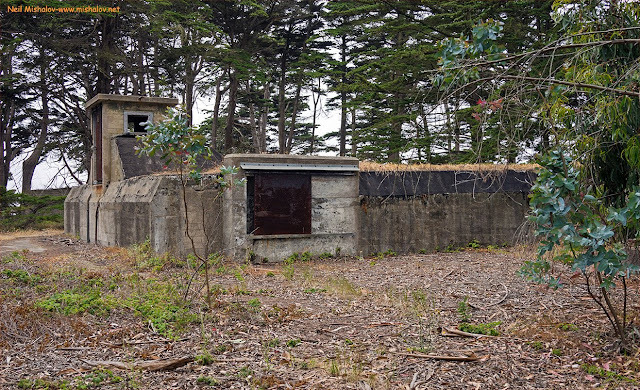 This gun battery had two non-disappearing 6-inch guns. 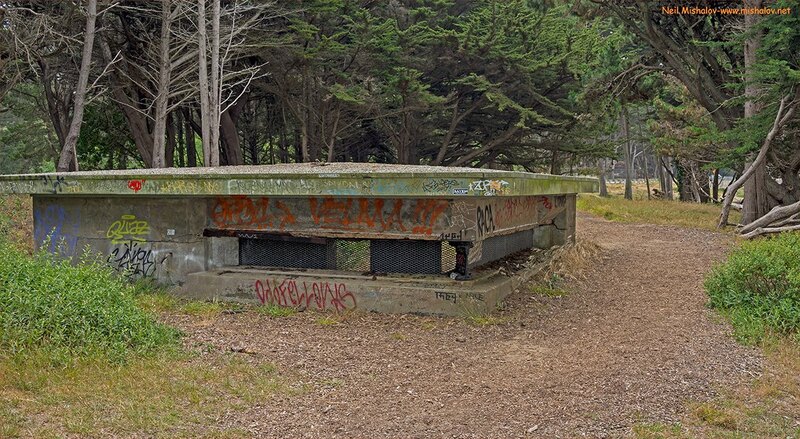 Construction of this gun battery began on 3 June 1899, and the guns were mounted in 1900. During the early days of World War II, Battery Crosby's two 6-inch guns were used to cover the approaches to the Golden Gate Bridge and the underwater defensive minefields in the Main Shipping Channel. 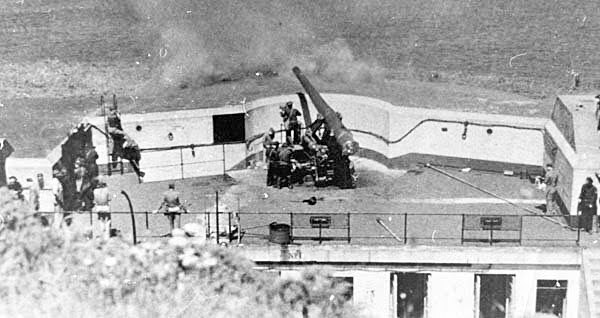 Battery Crosby was later deemed to be obsolete, and the guns were ordered removed on 6 December 1943. The view is looking east. This is a current view of Battery Crosby. 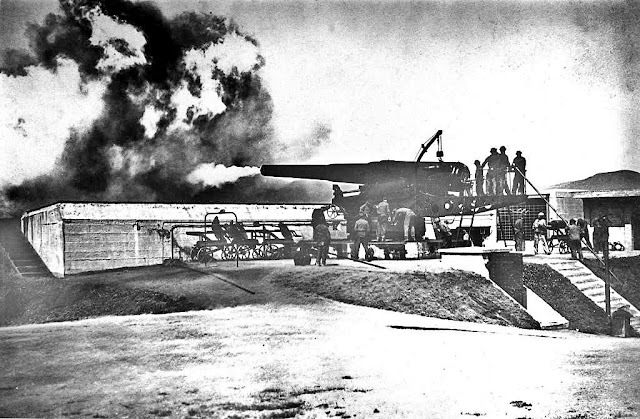 THEN A test firing of a non-disappearing six-inch gun mounted at Battery Crosby. The view is looking north, and this picture is circa 1930. 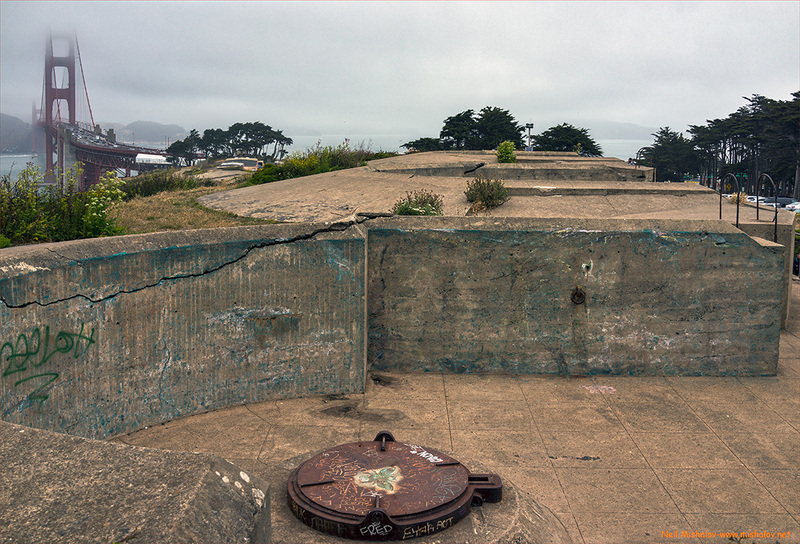 NOW Here is a view of Battery Crosby's gun battery number two. Battery Crosby is seen in the near distance. 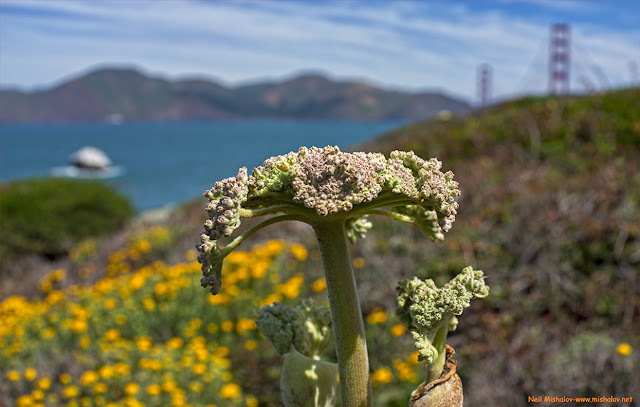 The Marin Headlands and the towers of the Golden Gate Bridge are visible. This is Marshall's Beach. 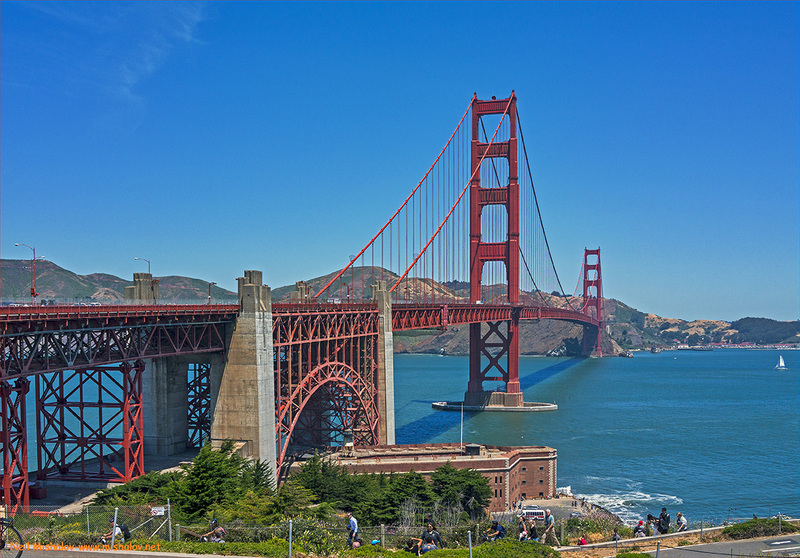 Ahead is the iconic Golden Gate Bridge. The bridge opened to the public on 27 May 1937. 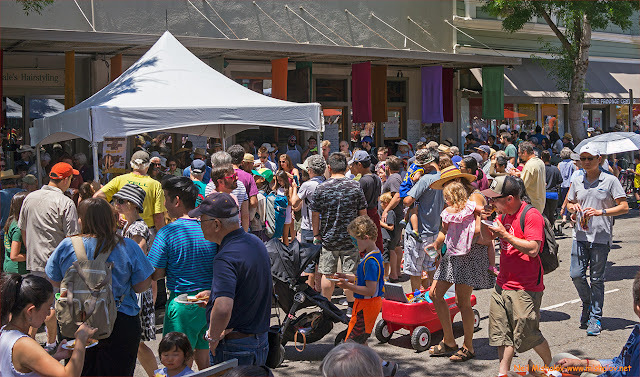 It is 1.7 miles in length and has a six-lane roadway. At the time of its construction, it was both the longest and tallest suspension bridge in the world, with a main span of 4,200 feet and a total height of 746 feet. It is still the tallest bridge in the United States, and on an average day, it carries 110,000 vehicles. 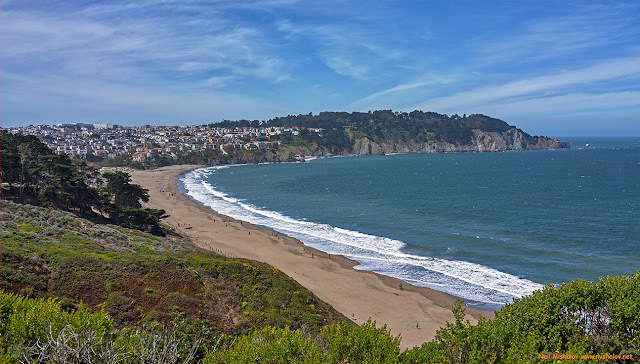 Here is a view of Baker Beach, looking west. The San Francisco Sea Cliff neighborhood and Lands End are both visible. 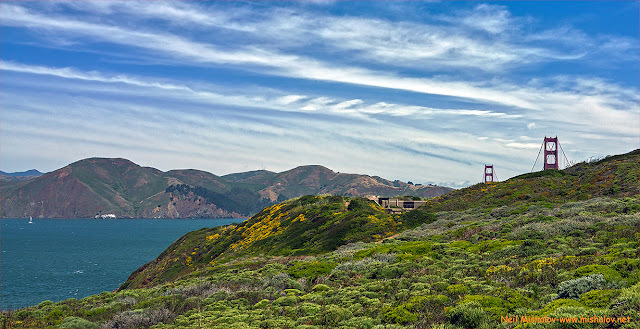 In 1891 the Federal government secured ownership of 54 acres at Lands End. 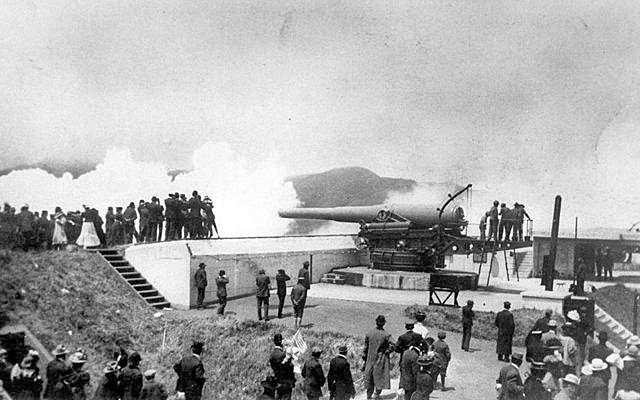 The construction of fortifications at Lands End, as part of the Coast Defenses of San Francisco, began in 1899. A battery of two 12-inch disappearing guns was completed in 1902. 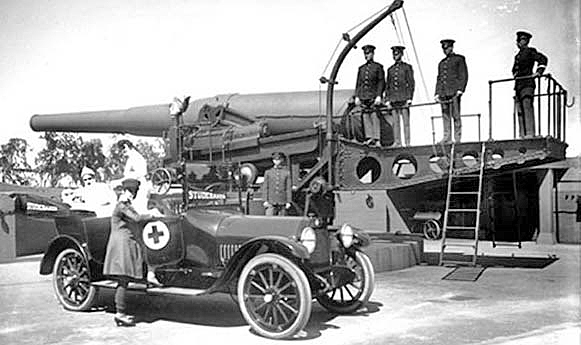 A third 12-inch disappearing gun was installed in 1903. On 27 November 1899, construction began on a mortar battery containing sixteen 12-inch mortars. The mortar battery was completed in 1902 and transferred to the Coast Artillery Corps on 26 September 1902. These weapons covered all of the approaches to San Francisco Bay. 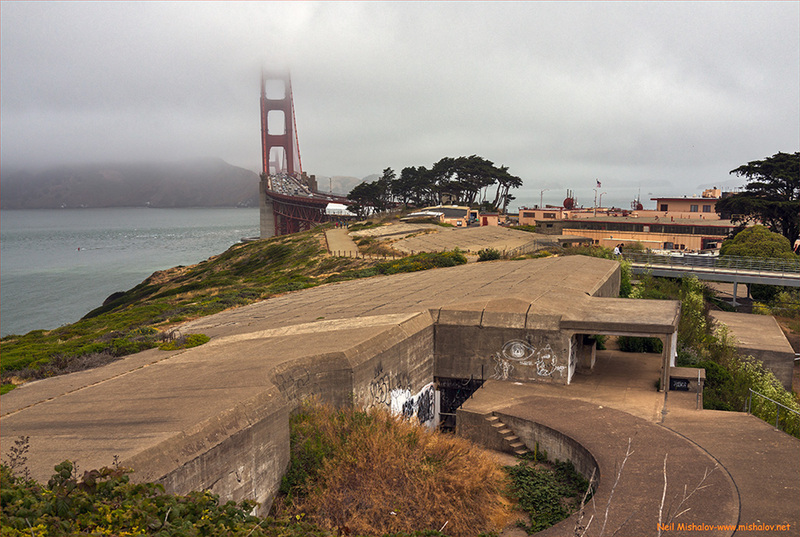 In 1900 the military reservation at Lands End was named Fort Miley. 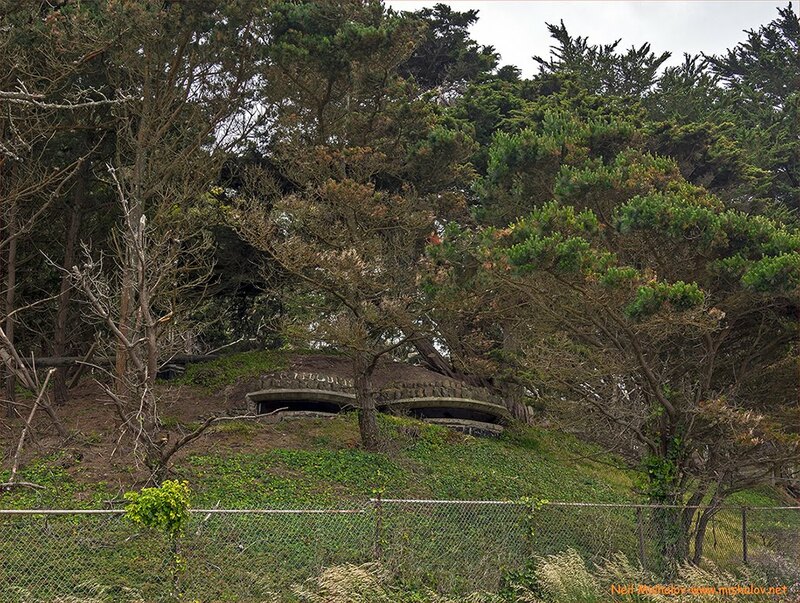 Fort Miley eventually lost its strategic importance, and by 1949 it was history. Battery Chamberlin is located towards the far end of Baker Beach. The battery was built in 1904, and it had four 6-inch disappearing guns. 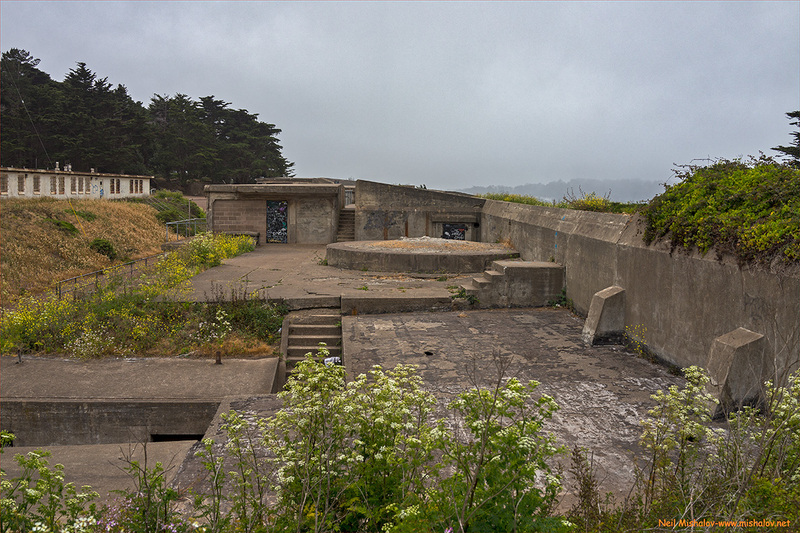 Battery Chamberlin was deemed obsolete after World War II, and the guns were ordered to be removed in 1948. 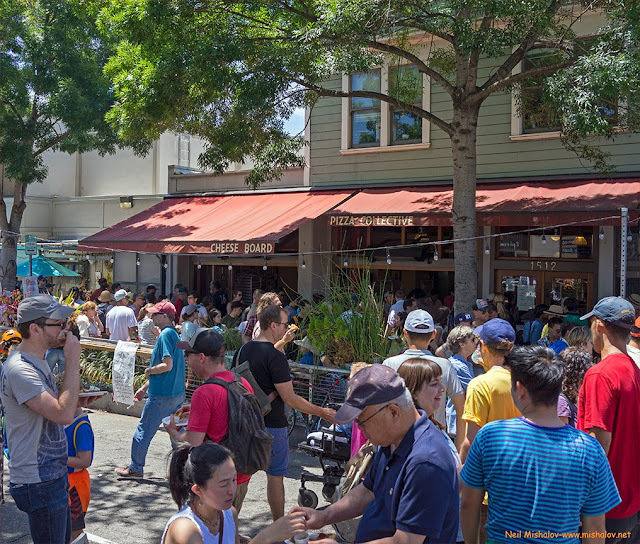 Go Here to see the photographs that I took of Battery Chamberlin during November 2016. "Harbor Defenses of San Francisco - A Field Guide, 1890 to 1950," was an essential tool in assembling this edition of the photo bog. Thank you, Matthew W. Kent. 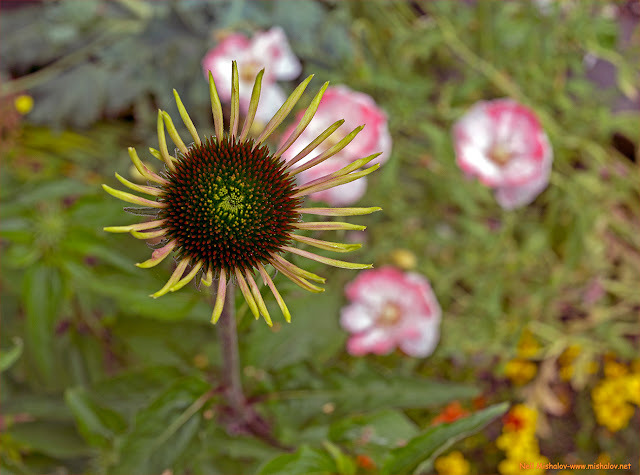 You may enjoy my 12 October 2016 photo blog post. 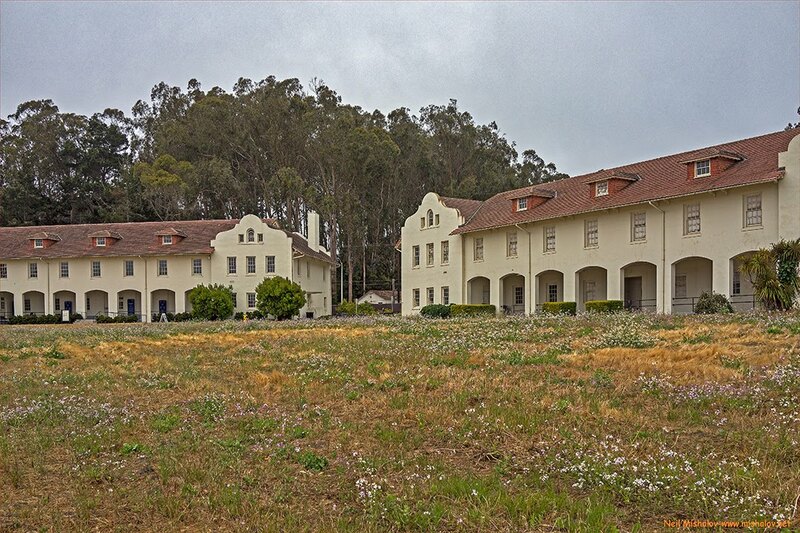 It contains additional information about Presidio Building #1648. 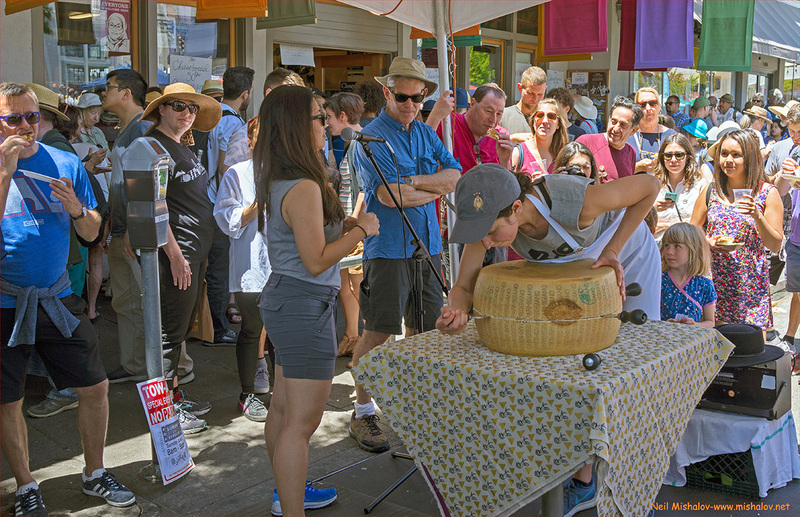 The Cheese Board began operation in 1967 in a small retail storefront located at 2114 Vine Street. 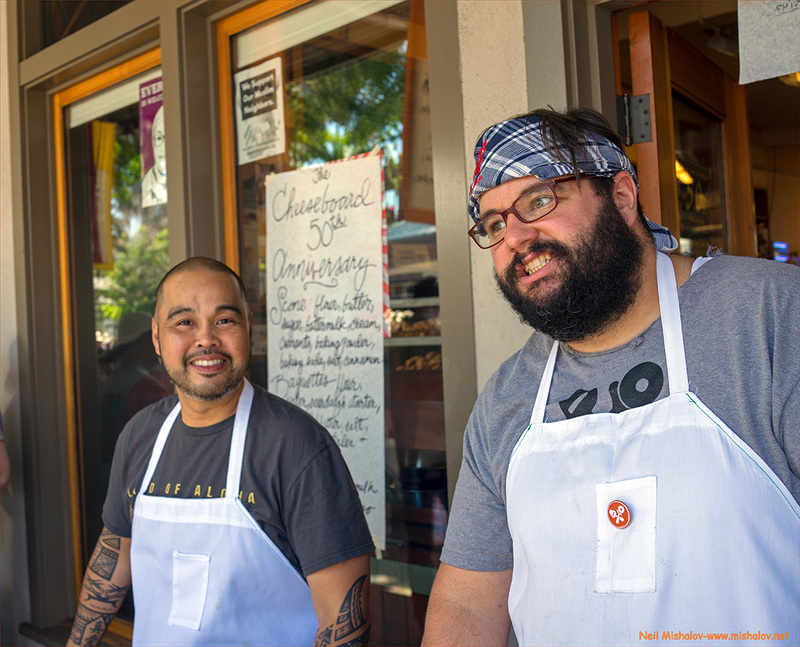 In 1971 the two Cheese Board owners sold the business to the Cheese Board's employees, and the two former owners remained at the Cheese Board as workers. 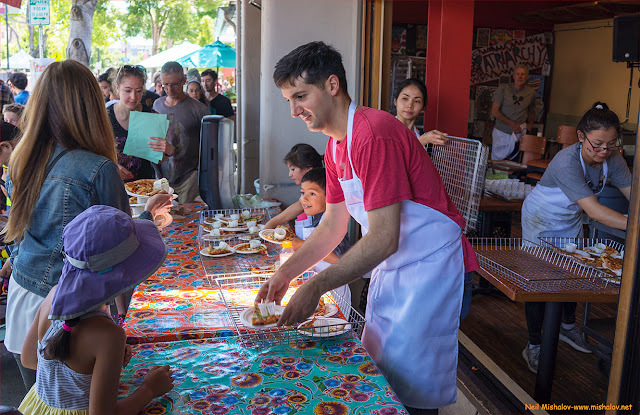 In 1975 the now renamed Cheese Board Collective moved around the corner to a larger retail storefront located at 1504 Shattuck Avenue. The 1504 Shattuck Avenue site is still occupied by the Cheese Board Collective. Happy 50th anniversary to all members of the Cheese Board Collective, past and present. 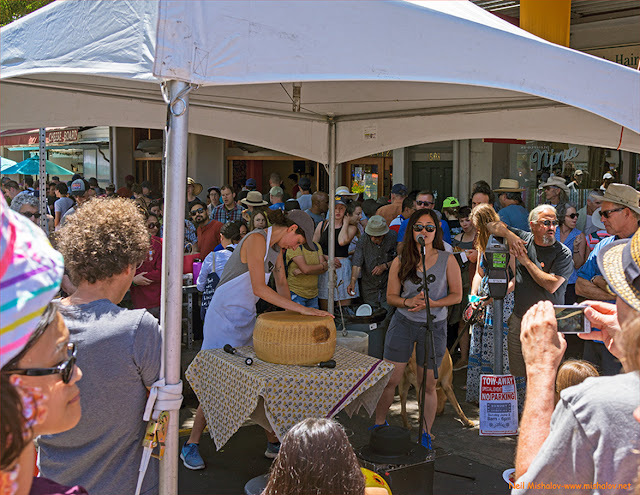 This excellent band is appropriately named "The Cheese Board Clerks."